In partnership with the Environmental Design Department and the Aquarium of the Pacific in Long Beach, CA, and with support from the National Endowment for the Arts, the Resilient Coastal Cities Studio challenged ArtCenter students to conceptualize, design and create an exciting, engaging exhibit that would effectively communicate a call to action for the residents of Long Beach and other coastal cities for resiliency in the face of climate change. SUMMER 2018: Two new exhibits are up at the Aquarium of the Pacific, designed by recent alum Allie Kollias (Environmental Design ’17) and student Alvin Oei (Environmental Design). Alvin Oei created an illustration for the construction wall, which will be up through the completion of the new building in 2019. Allie Kollias, who was awarded a Designmatters Fellowship in Summer ’17, designed an exhibit on sustainable fishing for the unused space in the staircase leading to the Aquarium’s restaurant. ArtCenter’s Designmatters and Environmental Design Department partnered with the Aquarium of the Pacific to explore how design and science can come together in an exhibition to educate Aquarium visitors and residents of Long Beach on the effect of climate change on coastal cities – and empower them to take immediate personal and community-based action, making Long Beach the model for a climate resilient coastal city. With support from the National Endowment for the Arts, the exhibition integrates solid science from scientists, researchers and experts while staging the material in an engaging and entertaining presentation that is easily accessible for Aquarium visitors of all ages. At the beginning, the students only had notes on paper and ideas in their heads. We presented them with facts about climate change, why it’s important and what average people can do to mitigate the effects. I am incredibly impressed with what the students created, especially the mascot of Sam and that the exhibit is spread throughout the Aquarium and that each display area is sprinkled with facts, conveying the overall messaging. That kind of repetition will get the messaging across and allow visitors to take it home with them. 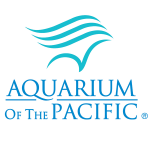 Opened in 1998, the Aquarium of the Pacific is the fourth most-attended aquarium in the nation, welcoming an annual 1.5 million visitors who come to enjoy and learn about diversity of the Pacific Ocean through onsite and virtual experiences. The Aquarium displays more than 11,000 animals in more than 50 marine life exhibits; the Aquarium openly embraces the latest scientific research to present important topics and issues facing the planet and ocean life through its exhibitions, educational programs, hands-on activities and lectures from leading scientists from around the world. The Aquarium positions itself as a community gathering place where diverse cultures and the arts are celebrated and where scientists and policy-makers can discuss and share relevant information on the relationship of humans with the planet in search for sustainable solutions. For seven years, Designmatters has developed a close partnership with the Aquarium which has provided students with real-world design experience opportunities to create complex exhibition projects that communicate science through art and design. As designers, we are problem solvers at our core and the greatest problem that desperately needs to be solved in climate change, even above pressing social issues like poverty and disease. Climate change will influence all of those. While it’s a monumental topic, it didn’t feel so big because we had a nice framework which is the Aquarium. We had to work around how best to attract people’s attention, especially when you are dealing with one of the biggest attention-diverters: live marine life. We also had to stay positive on the topic which can be inherently negative and be a turn off. We had to appeal to an age range and scale that’s small and local. We had limits set up that contained us and that all made for an achievable goal. For many coastal cities, climate change will bring environmental hazards such as sea level rise, coastal flooding, drought, air pollution and an increased number of hot days. Sea level rise will affect more than half of the 6.8 billion people worldwide who live near the coast as well as the hundreds of millions residing near low-level coastal areas. Throughout geologic times, sea levels have risen and fallen, but in the past century, sea levels have been rising at a significantly higher rate than ever before; major contributors to sea level rise are thermal expansion and the melting of ice cover in the Artic. Sea level is expected to rise somewhere between three and six feet by 2100—but it could potentially rise more than 20 feet if ice sheets in Greenland and Antarctica continue to melt at current rates. The results could be catastrophic, eradicating dry land and engulfing entire communities in water. With a diverse population of nearly a half million people, the City of Long Beach is vulnerable to these challenges. Long Beach Mayor Robert Garcia asked the Aquarium to take the lead in making the city a model of climate change preparedness by helping to raise public awareness and to develop a sense of urgency to mitigate the causes and adapt to the consequences. At the studio kick-off, students received briefings on different aspects of climate change from a panel of experts. Renowned climate scientist and Distinguished Professor Emeritus at Scripps Institute of Oceanography Richard Somerville summarized the overall history of climate change; NOAA meteorologist for the National Weather Service Mark Jackson outlined how climate change impacts extreme weather; Aquarium CEO Dr. Jerry Schubel explained sea level rise and coastal flooding due to climate change; and Aquarium exhibition designer Tom Bowman described effective communication messaging. Gathering field research, students visited the aquarium twice to become deeply familiar with the layout of the facility as well as conduct first-hand observation of visitors’ behavior and visitation patterns. Students had access to Aquarium staff and worked close with Dr. Jenny Lentz and David Bader from the Education Department who provided numerous research findings and data on Aquarium visitors. In addition to utilizing information presented at the kick-off session, students continued researching the science of climate change, paying particular attention to new habits that everyday citizens can adopt which may curtail impacts. Divided into teams, students worked on three distinct exhibition ideas – concepts that would eventually be merged into one unified exhibition. Student teams concentrated on celebrating the content in a cohesive design, weaving experiential pathways through narratives, and creating a human-centered approach while delivering the science message in an informative but emotionally engaging manner. Targeting visual and sensorial interpretation of data, students explored various media that could be employed: graphic panels, media/film, interactives and 3D models within a modular, expandable exhibit system. Three prototyped installations were presented at the mid-term where Dr. Schubel and the staff at the Aquarium of the Pacific offered constructive feedback on the storytelling, science and feasibility of the concepts. From there, students incorporated the feedback and united to work on a shared vision project which was presented at the final. We had to create a character that people can relate to and find empathy. Characters can be a great tool to get the message across. Visitors don’t want to read about climate change, but there are strategic ways to get into their brain so that the message is delivered and works. Uniting the narrative exhibition design is Sam, a character that will be infused in 11 distinct exhibition areas around the aquarium. Sam is a climate change activist, sporting a well-wore army jacket, colorful pins and a guerrilla-attitude. Her easy-going, street-smart tone and personal voice, relatable to kids and adults, reflects her passion for the environment. Coming from a family of researchers and explorers, Sam wants to share the message that every small choice can have a big impact. Her vehicle of choice is a colorful submarine. Throughout most of stand-alone exhibition displays, the F.E.W. concept is stressed. Representing Food, Energy and Water, F.E.W. involves information and simple day-to-day choices that individuals can adapt to reduce the threat of climate change. Exhibits lead visitors from the parking lot throughout the Aquarium, but because of the open design structure, they can be experienced in any order. In the parking structure, guests are greeted with big messages in the garage, stairwells and elevators. These handwritten-style messages from Sam introduce her voice to visitors. Simple quick scientific facts are paired with eye-catching artwork. Incorporating a soon-to-be construction wall that will shield the building of the Aquarium’s newest additions, this outside wall near the main pedestrian walkway depicts graphically the story of Sam’s journey to the Aquarium in her submarine. Visitors will see colorful artwork of marine life, but along with the carefree play of some sea creatures, there are subtle images of pollution and other perils. Visitors enter/exit a colorfully-renovated shipping container that doubles as a submarine. One side of the interior shows LCD screens in portholes with short video snips of Long Beach residents who are practicing coastal resiliency habits (planting a rooftop garden, recycling, etc.) The other side displays images of sea life, Sam’s heroes (Jacques Cousteau, etc.) and other marine collections. Located near the Aquarium’s official entrance, the Hub is where visitors finally meet Sam and pick up their viewfinders, an important item necessary at the following exhibits. Sam can be played by Aquarium staff members with appropriate scripting and coaching. Shaped like Sam’s submarine, the hand-held viewfinders have three Red, Green Blue (RGB) filters; these colors correspond to the three types of action visitors can take in response to a problem. Many exhibits will have a fabricated periscope with written text that can only be seen through the viewfinder. Read through the red lens to raise awareness about the topic at hand; green lens reveals an action that can be taken as a group; and blue for individual actions. Text will be short sentences and accompanied by simple artwork. Near the Hub are three nearby large columns where visitors can try out their viewfinders in the context of F.E.W. – Food, Energy and Water. The Food Column asks “Are We Eating the Right Fish?” Using viewfinders, visitors will see the Red Message contains quick facts about overfishing; the Green Message encourages eating a variety of fish, rather than just one species; and the Blue Message advocates for limiting fish consumption overall. Similarly, the Energy and Water Columns offer prompts about energy and water usage with appropriate messaging for each viewfinder color. On the second floor at the top of the F.E.W. columns, visitors can jump on circular floor pads to play a game involving F.E.W. topics. Near the outdoor first floor shark tank is a sculptural exhibit constructed from tall rows of empty plastic bottles on sturdy frames. Visitors (especially young ones) enter the sculpture and, like fish swimming through plastic, must navigate their way to find the RGB messaging prompts. Using their viewfinders, they will learn about the problem of plastic in the ocean – and ways they can lessen their impact. This interactive game on the second floor reimagines Long Beach as a model of sustainability. A docent guides visitors to play the game by choosing pieces from the F.E.W. bins to place on a large map with neighborhoods and local landmarks, etc. Visitors use their viewfinders to find RGB messaging that summarizes choices made. Before moving on, visitors can pick up an Idea Lab Zine, a guide that describes ways to incorporate sustainable actions at home. An additional section offers tips to help parents talk about climate change issues with their kids. This display features Myra, a real electric eel as a metaphor for alternative nature-based energy sources. Visitors step on a floor tile, receive a mirror message and then light a nearby lightbulb. Viewfinder RGB messaging describes the latest alternative energy types and energy uses. Guests can play a timed 60-second sustainability fishing game located in Café Scuba. The object of the game is to sort the fish species into three possible boats: OK to eat, only eat on occasion and avoid. At the end of the game, the player receives a percentage score and encouragement about choosing sustainably-fished seafood. Exhibit Ten – Sort it out! Three distinct messaging designs/experiences target visitors’ habits on trash disposal are strategically positioned at Café Scuba. Messaging on tray placemats and paper cups reminds visitors how to best sort trash after their meal. Tray placement artwork depicts the differences between waste that can be recycled, composted or put into trash receptacles. Paper cups show facts about reduce, reuse and recycle. A nearby “Help Clean the Ocean” game resembles a trash container; heavy magnetic pieces – labeled recycle, compost and trash – are moved into their places to complete the game. Café Scuba’s garbage collection system is divided into three bins that correspond to recycling, compost and trash. Color-coded signage explains the sorting process that allows visitors, especially children, to consider trash sorting as an extension of game-playing. Organized outdoors near the public plaza, the F.E.W. Fair showcases local vendors who specialize in sustainable goods and services. Three large F.E.W. columns provide shoppers with an overview of vendors, facts about climate change and ways to be a part of the solution. Stickers in the shape of Sam’s submarines (and corresponding to the RGB viewfinder messaging color categories) are placed on sustainable goods. Additionally, stickers could also display energy and water cost savings by using certain products. We focused on a persona and really strived to understand the demographics of the people we were trying to reach. We were very fortunate that the Aquarium has done so many of their own studies so we had a lot of the background information available to us. We were given excellent information as a base and that informed us along the process to make this exhibit flourish.